Project Derek Dog Houston – This Weekend Featuring The Pet Psychic! Think your pooch has what it takes to be best in show? No need to wait for the Westminster Dog Show. 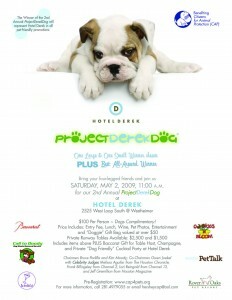 Hotel Derek will host its second annual Project Derek Dog on May 2, 2009 to benefit Citizens for Animal Protection. Last year more than 200 four-legged canines cruised the catwalk, but only one pooch walked away with the title of official Derek Dog, representing the hotel throughout the year in pet-friendly events. 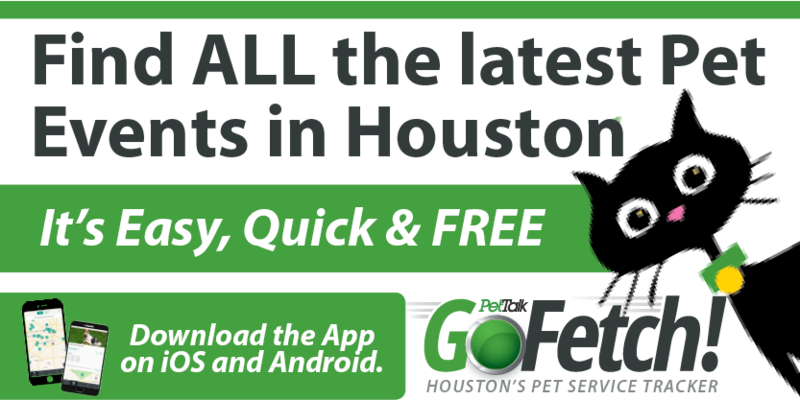 “Hotel Derek caters to a canine-friendly crowd, so we love partnering with CAP, which does such an amazing job rescuing Houston ‘s homeless animals. Last year we were overwhelmed by the turnout and our ability to raise much-needed funds for CAP. If you want to participate, we suggest you high-tail it to CAP and get your ticket early,” said Hans Schmitt, Hotel Derek general manager. What: Project Derek Dog will select a small and large dog as well as best all-round winner, who will represent the hotel in all pet-friendly promotions. The event includes a delicious lunch, wine, entertainment, and a pet boutique. Guests will also receive a chic doggy bag with goodies with a minimum value of $50. Entertainment will feature Sonya Fitzpatrick, the Pet Psychic. Who: Chaired by Kim Moody, Bruce Padilla and Gwen Joekel; Celebrity Judges Melissa Aquilar, The Houston Chronicle; Frank Billingsley, Channel 2; Lori Reingold, Channel 13; and Jeff Gremillion, Houston Magazine. How: Tickets are $100 per person and the dogs get in for free. Private runway tables for $5,000 and $2,500 that also include Baccarat gift for table host, champagne, and Private “Green Room” Pre-Party with Sonya Fitzpatrick, the Pet Psychic for you and your dog. Please print, complete, and submit the Derek Dog 2009 RSVP form to attend the event. For more information, contact Hershey Grace at hersheycap@aol.com or 281-497-9055. Seating is limited to 250 – purchase your tickets to this fabulous event today! 2 Responses to Project Derek Dog Houston – This Weekend Featuring The Pet Psychic! Sounds interesting for me and my dog. Thanks!